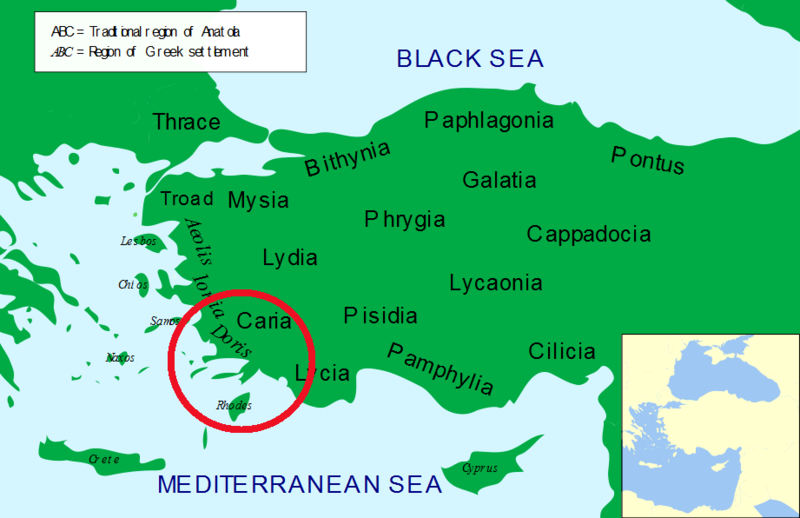 This category also traditionally includes the Carian Islands, of which Rhodos is the largest and most important. Rhodes was an important slave-trading center, and known for The Colossus of Rhodes - a huge statue of Helios measuring 32 meters built in 280 B.C. but destroyed by an earthquake later in that century. It has inspired many later sculptures including the Statue of Liberty. Ref: RPC 2834; BMC 28; SNG Munich 76. Ref: RPC I 2845; BMC 97-8. Reverse: head of young male right, ? Ref: Ashton 234; HGC 6, 1469. Reverse: APTEMΩN / P-O, rose with bud to right, hook to left; all within incuse square. Reverse: P - O / Σ. Rose with bud right. Ref: BMC 108 ff. var. (letter). Ref: BMC 13 var. SNG Cop. 486 var.